A hilltop hideout in south Seattle for some of the city's best pizzas. 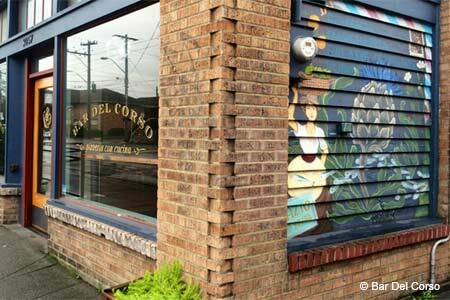 : Nestled on the top of Beacon Hill, Bar del Corso misses out on the attention grabbed by pizzerias in Seattle's more prominent locations. But the wood-fired pizza oven, covered in blue tiles and imported from Italy, produces pies with paper-thin crusts under the eye and by the skilled hands of chef Jerry Corso. We suggest the classic margherita drizzled with a fragrant olive oil, and a funghi version with crimini mushrooms, cherry tomatoes, house-made sausage and a generous topping of pecorino and Fontina cheeses. Small plates, made with local, seasonal ingredients, are equally enticing. Choices rotate and may include vongole alla marinara, grilled octopus and baccalà mantecato, a dish of whipped salt cod and potatoes with garlic and Parmesan. Several salads are ready to pair with pizza. The full bar features regional Italian wines, up to five local beers on tap and Italian cocktails. The pizzeria's interior behind expansive windows looking out to the street is crafted in dark wood with casual wooden tables and chairs. During warmer months, a covered space behind the restaurant offers a delightful outdoor dining option.